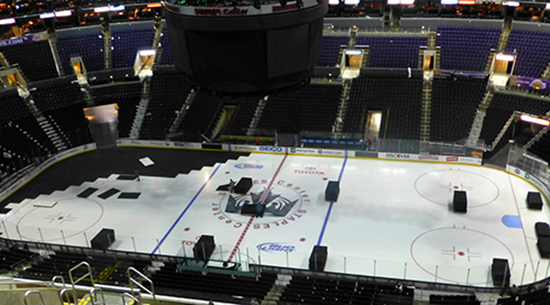 Ever wondered how the Staples Center floor goes from a Basketball Court to a Hockey Rink on the same day? The Los Angeles Staples Center is one of a handful of arena’s around the country that not only has a professional basketball team and a professional hockey team they have two professional basketball teams the Los Angeles Lakers and Los Angeles Clippers so scheduling both NBA teams as well as the Los Angeles Kings during the October through June games at the Staples Center is a tough job. Don’t forget to through in all of the concerts and theatrical type events that go on as well during those months. On any given weekend and sometimes weekdays there can be an early basketball or hockey game usually at 12:30 pm pst and then a hockey or basketball game at 7:00 pm pst. Given a NBA game can last about 2 hours and 30 minutes and the average NHL game lasts about 2 hours 20 minutes that doesnt leave much time. The typical temperature inside the Staples Center for a Lakers or Clippers game is 75 degrees and 65 degrees for an LA Kings game. As either the Hockey or Basketball game ends the crew is already in place to gets the changes done as quickly as possible. The 83 actual sections as well as over 168 luxury suites need to be cleaned, as well as all other areas inside the Staples Center including all bathrooms, the Hyde Lounge, the Premiere Club and Levy Restaurant and more. The Pro Shop needs to switch out the team playing inventory to the team playing that night’s inventory and numerous other little changes that are done to perfection the only way the Los Angeles Staples Center crew can do it. If its an early basketball game once the players exit the court and as the crowd is leaving the entire arena starts to get cleaned, the Maple Wood Court floor is removed piece by piece, ad’s are replaced, the courtside seats as well as the score table are removed. The Staples Center team lowers hydraulic seats onto the floor, and all nonstationary seats are withdrawn from the floor. The main reason that the transfer between a basketball court and a hockey rink can happen so quickly is….the Hockey Rink is always there the basketball court is just overlayed on top of it. The crew removes the overlay sheets and rewires everything needed for a Hockey game. Since the ice rink is already in place, they corner dasher boards are replaced, and the Plexiglas is placed on the dashboards as well as cleaned. Then the ice itself is cleaned by the Zamboni. The conversion from basketball court to ice rink or the other way around is a well-oiled machine and having two storage area’s inside the Staples Center helps speed up the entire process since all running machines as well as furniture and everything else used for either event can enter the floor from one passage way and leave from another. L.A. Kings Rink to Lakers Court to Clippers Court. The Staples Center undergoes a transformation from basketball court to hockey rink in a short period of time. 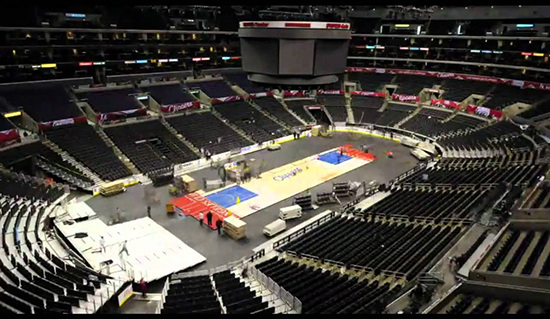 What the Los Angeles Clippers court looks like being broken down getting ready for the LA Kings to play that night. Staples Center Crew changing the LA Kings Ice to get ready for the Lakers Game a the Staples Center that night. If your going to an LA Kings game you can check out my article on the Best Place to sit for a Kings game at the Staples Center. You can purchase concert, sports and theater tickets for all Staples Center events. You can also checkout our Staples Center seating chart if you have any questions about seat locations. Barry’s Tickets is located caddy-corner from Staples Center! Open seven days a week, 9 am – 9 pm, for pickups. that is an amazing job,and I think is going t motivate many poeplo to promote multi sports stadiums. When you change the basketball court to hockey rink then first you clean the entire court. If wood court floor is there then remove that floor’s each piece, replace the ad’s, also the court side seats and if the score tables are there then remove that. High quality of material should be used for that floor. All the non-stationary seats are removed. The overlay seats can be changed and everything should be renewed depending on the type of the game. By taking the help of a professional you can change the basketball court to hockey rinks. Pingback: Where are the best seats for a Los Angeles Lakers game?